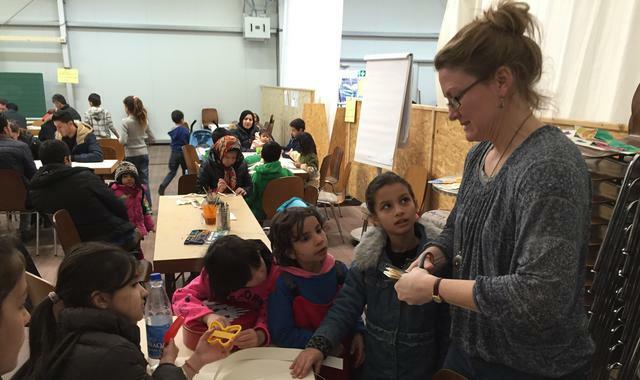 I began volunteering in refugee camps near Frankfurt, Germany, when my daughter’s school gymnasium was converted into an emergency shelter in October 2015. What I began doing out of a sense of moral duty has long since turned into an ongoing and deeply rewarding experience. Transcending all cultural and language barriers, my work with refugees has connected me to individuals whose examples of quiet dignity amid unimaginable sorrow and loss have given me a new perspective in my own life and have blessed me and my family profoundly. Among the many refugees who have been examples to me is a good friend of mine from northern Iraq, who spent several years working for the U.S. government in personal security. After the U.S. army left Iraq, my friend’s life was in danger and he had to leave. He really misses his family and the food, smells, and culture of his own country. However, even though his future status in Germany remains undecided, and even though he is all alone and struggling to learn a new language in a strange country, this man is a light. He shines hope and dignity into the shadows of his situation by looking outside himself and maintaining an attitude of giving. One afternoon at the camp, he sat down to color a mandala. While he colored, a young girl in the camp was stealing my markers and taking them to her tent. I sat across from him and pulled the girl up close. I explained to her that the markers were mine and that I would let her use them if she would just give them back when she was finished. I told her that I didn’t have enough money to keep buying new ones. When he heard that, my Iraqi friend across the table perked up. “Do you need money? I can give you money!” he said sincerely. I sent the girl off to another table with my markers in her fist, knowing full well they wouldn’t return to me. Then I turned to him and assured him I had plenty of money and that I was just trying to convince her to return the pens. He smiled knowingly and returned to his mandala. I walked away from that scene feeling like I had been entrusted with much more than this man’s meager wealth. I had been entrusted with the opportunity to allow him to be the giver for the first time in a very long time. When I accepted his money, I allowed him his dignity. Among all the giving done that day in the camp, my friend gave the most by far. Trisha Leimer is the president of Their Story is Our Story: Giving Voice to Refugees, a nonprofit organization devoted to telling the stories of refugees. She is a mother and a grandmother, and she works at an after school daycare program. A U.S. citizen, she has been living with her husband in Germany for 16 years.